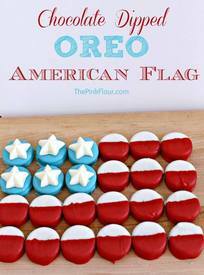 Chocolate dipped oreo american flag! Wow, I can’t believe Memorial Day is upon us already. It seems like just yesterday it was Christmas! If you’re new to The Pink Flour, you may not know yet that I love Oreos…especially chocolate dipped ones. So I thought up this fun (and EASY!) way to make them patriotic – perfect for Memorial Day or 4th of July.